A friend introduced me to a simple foot reflexology technique I’d like to share with you. Then, you can share it with your friend or loved one by practicing the technique. But, first, let’s make sure we understand what it is. A Massage by Any Other Name? Those of us who believe in natural remedies, however, beg to differ. Reflexology improves circulation and relieves tension enabling the body to function at optimal performance. It feels good, and even the most vocal critique can’t deny the relaxation found under the skill of an experienced Reflexology practitioner. While some literature calls the therapy a type of massage, it is, rather, the applying of pressure on particular ‘pressure points’ in the hands and feet. Knowing these pressure points are key to the success of the therapy. Ingham mapped the entire body into “reflexes,” and claimed that our hands and feet are especially sensitive. She tested her theory again and again on her physiotherapy patients. Then in 1938, published a book called “Stories the Feet can Tell.” The book illustrates how various pressure points of on our feet have nerve connections to other organs in our body. She taught that when pressure is applied to those points, the corresponding organ responds to the pressure. It was after Ingham’s book was translated into seven languages, that Reflexology grew in worldwide popularity. Reflexology is one therapy that primarily targets the feet. And the primary intent of this treatment is to heal the person as a whole and not merely addressing the perceived symptoms. The focus on the foot as the main gateway to getting well can be traced to a number of studies made in the past. Based on these studies, the anatomy of the person can be traced to the sole. For example, the heart and the rest of the organs have representations on the foot of the individual. Find that pressure point and one can treat heart abnormalities. It is believed that the energy flow in the body that goes into every cell follows a path, and this connects a number of organs and glands. Pressure points for this energy are present on the feet and the hands. When pressure is applied and the person feels pain, then this suggests that the energy flow has been blocked. Or perhaps a disease is present or pending. 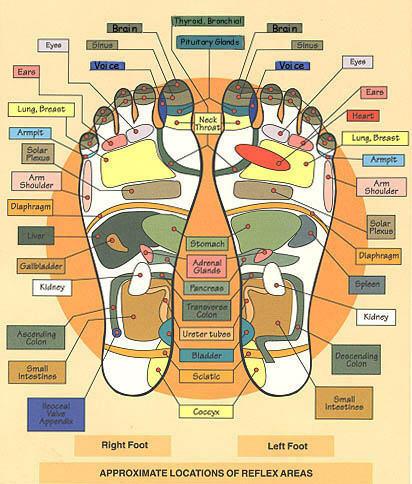 When the pressure points on the feet are massaged, the energy flow can be cleared, thus healing that part of the body. From the perspective of reflexology, this is how it all works. As you can see, this puts much emphasis on the feet. As they say, in all activities it’s best to start on the ‘right foot.’ And for massaging therapy sessions, you may want to wash both feet of your friend with the use of warm water. Add some fragrant oil to the warm water for better relaxation. Next, dry the feet. Use a towel to cover the other foot that will not be massaged. Now hold the foot that you want to massage, and you can start the massaging process by using the thumb. Just apply pressure to the sole. In applying pressure to that area, make sure that you are firm but not exactly using too much force. The rule here is to start at the toes of the person and work your way towards the heel. Once done with that part, you can now go to the top of the foot. Make sure that you massage (apply pressure points to) the whole foot and ankle at least twice. While doing these actions, ask your friend if you are doing it right. Or ask the person if he feels any pain due to the massaging actions that you are doing. If he says that there is pain, then apply pressure on the said area for at least 30 seconds and work on that area repeating the process until that soreness or pain is gone.